When's a street light called a grass light? When it's not lighting a road or a building or anything else but grass? I saw that a lot in the south. 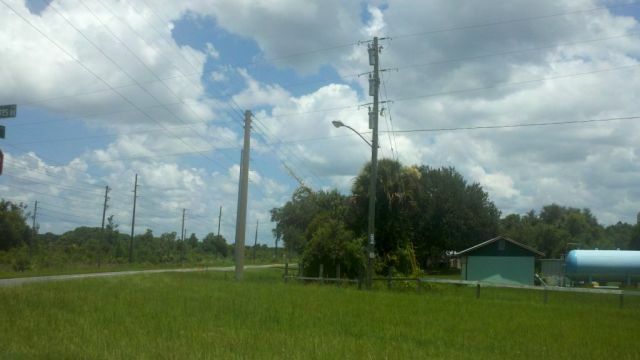 In the town I was in, there was one stretch of lights along US190 where several NEMAs were mounted on 20 foot truss arms, but still over 100 feet off the side of the road. Nothing like the beautiful cool white light of a coated Mercury Vapor lamp and the soothing hum of it's magnetic ballast. I saw lots of lights way off the road on US 441. It actuly bothers me, it just doesn't seem very effective. California has a neat set up with evenly spaced street lights mounted close to the streets. But at least an inhabited area. A nice phenomenon here in former East Germany were in the nineties the "lit fields": Every village believed that all they need to become a boomtown is setting up a new business park. Trouble was, no company took a seat there, and so the new streetlights in these business parks lit streets that led to nowhere. This could be a "Private Area Light", that the home owner or business in the back ground is leasing this light from the utility company. ive seen this before...there's an AEL 115 that's mounted 15 Feet or so from the road facing the opposite direction...there's not even any property within 50 Feet of the light. Personally i think that all Lamp Bans are idiotic,the idea of telling us we cant use this lamp type just cause its less efficent is highly communist in nature...really what good is it going to do? UPDATE: This grass light is now disconnected, and a new pole and mastarm was installed close to the roadway. An AEL 115 FCO, 250w HPS was installed.